Does America Really Need to Feature Death Symbols On Its Military Badges? I know that weapons kill. And I know that drones can be particularly deadly. That's the destructive nature of war, after all. But do we really need to feature the symbol of death in our military badges? The insignia above is the symbol of the US Navy's Executive Office for the Unmanned Aviation and Strike Weapons Program. They are a boring department, in charge of acquisitions. They're not a combat unit. The sit behind desks, not in bunkers. They spend their days looking at spreadsheets and specs, evaluating unmanned airplanes and missiles. And sure, among the many weapons they have procured you can find the General Atomics MQ-9 Reaper. But that doesn't really matter. Their symbol is still unnecessarily grim—not to mention horribly designed. 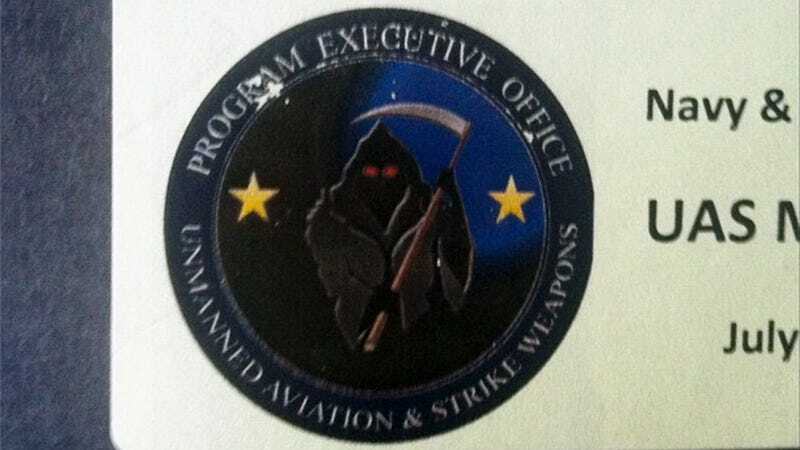 Of course, this is not the first time that the reaper has been featured in military insignia. During World War I, a French aviation squadron included this symbol too. Other units did the same through the decades. More recently, the American Fighter Squadron 101—a US Navy F-14 Fleet Replacement Squadron based at Naval Air Station Oceana—also included a flying reaper on their badge. They called themselves the Grim Reapers. But the most famous use of death symbols belongs to someone else: all the Nazi SS and Waffen SS units featured skulls on their uniforms. That's not a very good example to follow. In fact, in an era in which the US military is sometimes perceived as unnecessarily aggressive by most of the world, perhaps it would be a good idea to avoid featuring skulls and bones on emblems. Independent of their historic use, however, this case is particularly horrendous. Especially since this is not some wacky pilot-designed badge for an attack squadron but just the insignia for an office, a department of the Navy in charge of UAV and weapons acquisitions. Pencil pushers, serving up death by spreadsheet.